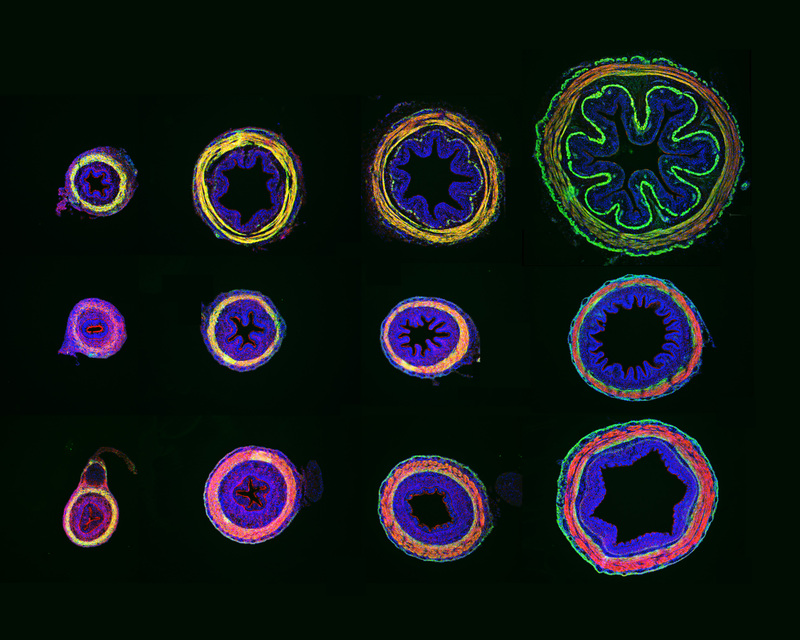 These images show cross sections of the different compartments of the developing gut in a chick embryo: esophagus (top), small intestine (middle), and large intestine (bottom), at days 6, 8, 10, and 14 (left to right). As the chick develops, the shape of the gut changes from a simple tube to a more complex form with specific surface folding patterns. The way the surface is shaped in each compartment is important for proper digestion. For example, the small intestine has finger-like projections termed villi that increase the surface area in order to absorb nutrients. Physical forces acting within the growing gut likely cause these unique topologies. To watch an animation of how the gut develops in a growing human embryo, click here. Contributed by Tyler Huycke, a fourth year graduate student in the Biological and Biomedical Sciences program at Harvard Medical School. Previous Previous post: Can scientists prove that Zika virus causes microcephaly?